Evergreen or summer deciduous perennial with a long-creeping, scaly rhizome. Lanceolate, 10-60 cm long, 2-15 cm wide, pinnatifid with sharp deep incisions and elongated pointed segments with toothed margins; rachis with rusty hairs on upper surface in the top one third. Dry and seasonally wet rocks, trees, and soil humus in the lowland and montane zones; common in coastal BC; N to SE AK and S to ID and CA, disjunct in AZ. A shade-intolerant, submontane to montane, Asian and Pacific North American fem. Occurs in maritime to submaritime cool mesothermal climates on very shallow, calcium­rich soils; its occurrence decreases with increasing continentality and elevation. Scattered to plentiful in open-canopy forests on water-shedding and water-receiving sites. In­habits exposed soils, coarse fragments (boulders), or cliffs affected by temporary surface flow of water and/or fine or­ganic materials. Common on the calcium-rich bark of broad-leaved trees, typically on Acer macrophyllum. Characteristic of mesothermal forests. The climate type for this species, as reported in the: "British Columbia plant species codes and selected attributes. Version 6 Database" (Meidinger et al. 2008), is cool mesothermal. 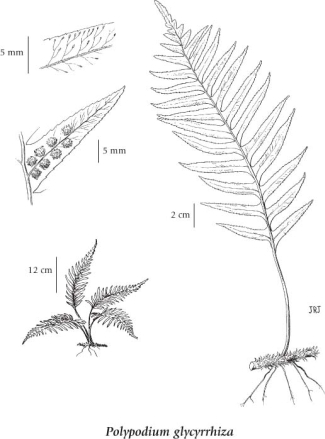 Polypodium vulgare var. occidentale Hook.